Hi again! Good day. Just want to inquire how to get to Ocean Park from Mirador Mansion. The fastest & easiest way pls. And let me know the fare also. We were 4, 2 adult and 2 kids. Thank you very much & God bless. Hello, I've read that the Symbio theater show in Oceanpark starts around 6:30-7:00pm. If this shows ends around 8:00 or later, is bus 629 still available for commuters at that time? What time is its last trip? If it's unavailable by that time, how can we go back to Mirador Mansion from the Oceanpark? Really appreciate your prompt response. Here's the most efficient way to get into the Ocean Park from Mirador Mansion. 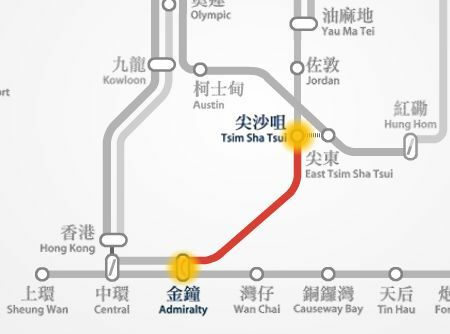 Get into the TST MTR station --> take the Tsuen Wan Line train and get off at the very next station - Admiralty station (please refer to the MTR route map below) --> take Exit B (5 minutes train ride @ HK$8.1) --> upon exit, take the bus no. 629 that will bring you straight to Ocean Park entrance (25 minutes @ HK$10.6). Please follow same travel route in reverse order in getting back to TST.